The competent teacher builds and maintains collaborative relationships to foster cognitive, linguistic, physical, and social and emotional development. This teacher works as a team member with professional colleagues, students, parents or guardians, and community members. In the course of my CI 335: Educational Technology course at the University of Illinois, I created a personal learning network that allows me to stay connected to practitioners, organizations, and others with contributions to the fields of social science and education. Through the use of Google Reader and RSS, I can be linked to information, resources, and people that can all promote my growth as a teacher and as a person. In addition to this, my cohort and I established a Networked Research space on Diigo in order to collect and share resources for the teaching of social studies. My Personal Learning Network, as well as the Networked Research space that my colleagues and I created, demonstrate my ability to meet Standard Eight of the Illinois Professional Teaching Standards: Collaborative Relationships. My Personal Learning Network includes content from various sources, including practitioners and educational organizations, all of which help me continue to learn as a teacher. By collaborating with others through the use of Google Reader, I can keep up to date with the new ideas, unique perspectives, and helpful resources that others can provide. My Networked Research space functions in a similar way, providing resources and information that can help me better my teaching practice. This space contains a variety of videos, articles, and tools found to be of use by my cohort and I. Both of these digital tools promote collaborative relationships with my colleagues. I chose to use this artifact because all of the information found in this space can be used to improve upon our teaching philosophies and strategies. This is an appropriate representation of this standard because the space also allows for my cohort and I to collaborate and share resources with one another. The PLN and Networked Research space both help me to continue growing and developing as a teacher. They allow me to establish and maintain collaborative relationships that will help me develop not only a teacher, but as an individual as well. They also give me access to tools and resources that I may not have had access to previously. By using my information literacy, I can continue to grow in my career and improve upon my methods. In short, through working as part of a team with professional colleagues, community members, and others, I can gain knowledge and discover new information that can make me a better teacher. During my time student teaching at a middle school in a small urban community, I had many opportunities to collaborate with colleagues in a plethora of ways. One of the most common methods of collaboration with colleagues was through team meetings. 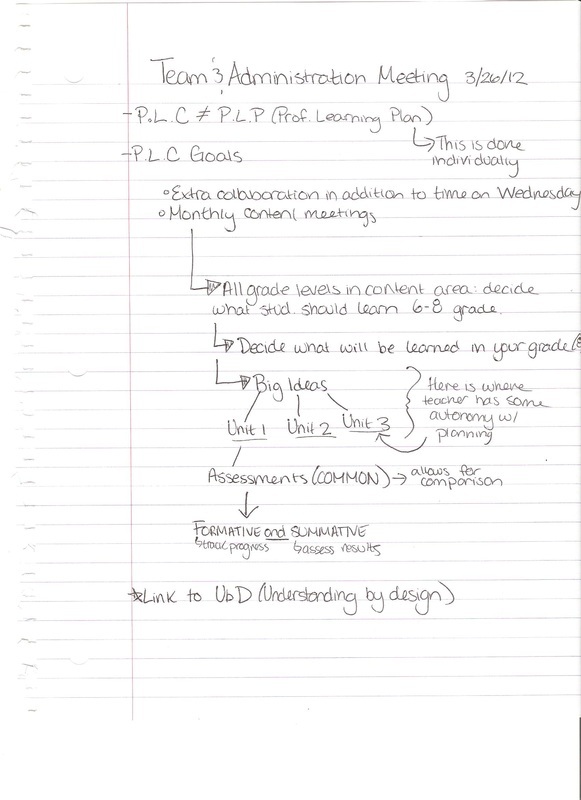 Below are notes taken on one of the daily team meetings held at the school, which includes planning for future collaboration and professional development. These notes on a team meeting in which administrators participated are meant to show my ability to meet Standard Eight of the Illinois Professional Teaching Standards: Collaborative Relationships. I chose to use this artifact because these notes not only illustrate my ability to participate in and contribute to team meetings, but also show the strength of the Professional Learning Community I had the opportunity to be a part of at this middle school. This community is one that is focused on clear educational goals for the various content areas, including goals that are across all grades levels as well as ones that are grade-specific. In addition, members of the PLC collaborate to create common assessments for students. The notes are an appropriate representation of this standard as they demonstrate my ability to collaborate with team members, administrators, and other colleagues to make decisions and engage in problem-solving in order to better serve students. As a whole, these notes on a team meeting I participated in showcase my progress as a teacher and my growth in my abilities to work with others in an efficient and positive manner to help student learning.